37th Season of FREE Performances of music, dance, family events and more through August 27! From August 2-August 27, Lincoln Center’s plazas will be filled with more than 100 FREE performances by exciting international, U.S. and local artists for Summer of Love: Celebrating the Spirit of the ‘60s. This year marks the 40th anniversary of the “Summer of Love” gathering in San Francisco—a defining moment of the era. Lincoln Center Out of Doors, conceived in 1970, was inspired by ideas about arts and community arising from social and cultural changes brought about in the 1960s. For its own “Summer of Love” 2007, Lincoln Center Out of Doors offers music, dance, street theater, and family events highlighted by artists and styles of the period—soul, gospel, jazz, and folk, the Boogaloo, a 60s-style “Dance In,” the noted artist/activists Bread & Puppet Theater, and more—while throughout the festival’s varied events, the spirit of community, renewal, multiculturalism, artistic experimentation and vibrant expression will hold forth. 1960s folk legend Arlo Guthrie (his era-defining 1967 song “Alice’s Restaurant,” celebrates its 40th anniversary this year) opens Out of Doors on August 2 with Solo Reunion Tour–Together At Last. And an 85th birthday tribute for Charles Mingus, acclaimed avant-garde jazz innovator of the ‘60s and ‘70s, by the Mingus Big Band and Mingus Orchestra conducted by Gunther Schuller will take place on August 26. Salsa sensation La India closes Out of Doors 2007 with a sizzling Damrosch Park concert on August 27. This summer’s “Great Dance” presentations in the Damrosch Park Bandshell are highlighted by the return of two Out of Doors favorites: Paul Taylor Dance Company (August 3 and 4) and the Trisha Brown Dance Company (August 14)—both founded by celebrated choreographers who developed their artistic voices in the 1960s. Noted Hawaiian hula troupe Na Lei Hulu I Ka Wekiu will appear on August 10 and 11. And the double bill of Lula Washington Dance Theatre and Les Ballets Jazz de Montreal [bjm_danse] is scheduled for August 16 and 17. Special events on the dance schedule include: 60s Snapshots, new works commissioned by Lincoln Center from dance experimenters Gus Solomons jr, Yoshiko Chuma, Merian Soto and Elaine Summers (August 23)—all innovators and experimenters who came to flower in the 60s or were influenced by artists who did; Solar One (August 21), works by rising choreographers who perform in July at the downtown, solar-powered theater; and Drumsong African Ballet Theatre (formerly known as Sabar Ak Ru Afriq) on August 10. Tapper extraordinaire, Roxane Butterfly, joined by guest tappers and a jazz trio, brings her Worldbeats—tap with an international flair—to Josie Robertson Plaza on August 15. And the New York Baroque Dance Company celebrates love with 18th-century music and dance on August 22. The fun-filled and rebellious spirit of the ’60s will fill "Howl on the Road" (August 11)—music, street theater, fashion, and more—celebrating the vibrant arts scene of the East Village and Lower East Side. Music experimenters who came to prominence in the 60s—celebrated composer Pauline Oliveros (August 21) and spatial music pioneer Henry Brant (August 22)—as well as others continuing in the spirit of experimentation today—Bill Milbrodt’s The Car Music Project, a band that performs on instruments fashioned from a 1982 Honda Accord, and electro-acoustic band Absolute Ensemble: Arabian Nights project conducted by Kristjan Järvi with guest artist Marcel Khalifé (August 25)—will reveal their fresh and original sounds. Composer/performer Carman Moore’s electro-acoustic chamber ensemble Skymusic (August 15) travels new paths with innovative blends of classical, jazz and world music. Other 2007 Out of Doors music highlights include jazz performances by the legendary Dave Brubeck (August 5); Jay Leonhart and Wycliffe Gordon (August 14) and Craig Harris’ TriHarLenium: A Sound Portrait of Harlem 1976-2006 (August 17). World music artists include renowned sitarist Kartik Seshadri (August 20); Africa’s Abdoulaye Diabate and Super Manden, Albanians Merita Halili and the Raif Hyseni Orchestra; and Puerto Rican dance music with Viento de Agua (“Heritage Sunday,” August 12); World meets urban hip-hop with Beatboxer Entertainment and Akim Funk Buddha (August 9); and The Caribbean Cultural Center explores the “Boogaloo” phenomenon (August 12). “Roots of American Music,” now in its 24th season, offers a stellar line-up with ‘60s iconic folk/protest singer Tom Paxton, headlining a daytime “Roots” concert (August 18) on a program that also includes Charlie Gracie, Sid Selvidge, Rosemary Woods and Jerry Silverman, with baseball songs from 1867-1922. The evening Damrosch Park concert features Gospel greats The Dixie Hummingbirds, opening for Sleepy LaBeef’s Country/Rockabilly Rip Roarin’ Jumping Jamboree with special guests including Dale Hawkins, Roy Head and Larry Johnson. On August 19, “Roots” will feature daytime performances by Harvest Wind, Chuck Brodsky, The Quebe Sisters Band, Diana Jones and Garnet Rogers. That evening’s concert in Damrosch Park has two greats from diverse traditions—bluegrass and klezmer—coming together in the 60s spirit of community and great music-making, to perform as special guests with each others’ bands: Ricky Skaggs with Andy Statman and The Andy Statman Trio, followed by Andy Statman, in the guest slot with Ricky Skaggs and Kentucky Thunder. Lincoln Center Out of Doors is sponsored by Bloomberg and PepsiCo, Inc.
Additional support is provided by Hess Foundation, Inc., Jack and Susan Rudin, The Starr Foundation, Disney, C.L.C. Kramer Foundation, The Jerome Robbins Foundation, The Harkness Foundation for Dance, HIP Health Plan of New York, Abraham Perlman Foundation, Richard and Gertrude Weininger Foundation Inc., The Reed Foundation, Inc., Amtrak, John R. and Dorothy D. Caples Fund, Great Performers Circle, Chairman’s Council, the Friends of Lincoln Center, and Young Patrons Society. Public support for Out of Doors 2007 is provided by New York City Department of Cultural Affairs, Kate D. Levin, Commissioner, and the New York State Council on the Arts. Operation of Lincoln Center’s public plazas is supported in part with public funds provided by the City of New York. Movado is an Official Sponsor of Lincoln Center, Inc.
WNBC/WNJU are Official Broadcast Partners of Lincoln Center, Inc.
Continental Airlines is the Official Airline of Lincoln Center, Inc.
Nokia is the Official Mobile Equipment Provider of Lincoln Center, Inc.
“Summer at Lincoln Center” is sponsored by Diet Pepsi. PLAYDAY is sponsored by Disney. La Casita is produced in cooperation with Claudia Norman, CN Management; Shawn Termin; The Smithsonian National Museum of the American Indian; The Mexican Cultural Institute; C. Daniel Dawson; Will Calhoun; and The Caribbean Cultural Center. La Casita is sponsored by PepsiCo, Inc.
McCollough Sons of Thunder From Harlem’s United House of Prayer comes New York’s premier “shout” Gospel band, bringing the rich tradition of African-American Gospel music to their brass ensemble. Led by trombone-playing Elder Edward “Trip” Babb, the group has collaborated with David Byrne, performed at The White House, Carnegie Hall, the Apollo Theater and at Lincoln Center. Gospel for Teens with special guest Cissy Houston was created to provide aspiring teen artists with fundamental vocal techniques, as well as historical perspectives on gospel, jazz, blues, and contemporary R&B. Each semester of workshops culminates with a performance. Cissy Houston (mother of Whitney Houston) began her career as a member of her family&apos;s gospel group, the Drinkards. With her group, The Sweet Inspirations, she recorded gospel-flavored soul in the late &apos;60s. Total Praise Choir of the Emmanuel Baptist Church of Brooklyn is a noted group of 150+ professional and amateur singers who hail from various locales in the metro-New York area and across the world. Sunset Drive Since 1999, the Virginia-born 1960s band has been performing with soul legends such as Percy Sledge, Eddie Floyd and Aaron Bell. Eddie Floyd with his Memphis sound, is best known for his 1966 R&B hit “Knock on Wood” (which he originally wrote for Otis Redding). Floyd was a member of the Stax recording label, composing and recording with fellow members such as Redding, accumulating over a dozen top 100 hits during the late 1960s-early 70s. Boogaloo Boogaloo Madness: We Like It Like That! Saturday, August 18 and Sunday, August 19 The distinguished mini-festival has brought many acclaimed artists and rare performances to Lincoln Center Out of Doors and this summer is no exception. This year’s line-up includes: (August 18, South Plaza): 60s folk/protest movement legend Tom Paxton, whose music continues to be infused with messages of justice and peace, on an afternoon program that also features rockabilly’s Charlie Gracie, bluesman extraordinaire Sid Selvidge, Irish singer/songwriter Rosemary Woods, and Jerry Silverman with songs about baseball written from 1867-1922. That evening’s Damrosch Park Bandshell concert opens with the glorious gospel sounds of The Dixie Hummingbirds who were influential in the 60s generation’s rediscovery of gospel; then in Sleepy LaBeef’s Country/Rockabilly Rip Roarin’ Jumping Jamboree, one of founding fathers of rockabilly, rockabilly leads a reunion of early rockabilly, rock n’roll and blues performers with special guests Dale Hawkins, Roy Head and Larry Johnson. August 19, South Plaza, Root’s afternoon concert presents bluegrass/gospel group Harvest Wind, singer/ songwriter of social commentary Chuck Brodsky, triple fiddlers/singers The Quebe Sisters Band, the soulful sounds of Diana Jones and Canadian singer/songwriter Garnet Rogers. Evening in the Damrosch Bandshell opens with Grammy-nominated down-home bluegrass from The Claire Lynch Band followed by two incredible artists coming together for one-of-a-kind music making—klezmer virtuoso Andy Statman and bluegrass giant Ricky Skaggs, each a special guest with the other’s band, The Andy Statman Trio and Skagg’s Kentucky Thunder, respectively, in the spirit of 60s community and multicultural music-making. Friday, August 24 Musicians, calligraphers, tea master, actors and floral artisans come together to illustrate the traditional arts that make up China’s ancient and venerable culture of tea in a sublime evening concert. Trance Music Ensemble was founded by Professor Ku-Fang Lin. The ensemble’s most popular works include “The Dialogue Between Tea and Music” and “A Cross-Section of Calligraphy, Painting and Music”. The former combines teas with different melodies within a tea ceremony to correspond with the varying moods of each composition. The latter illustrates the relationship between several artistic disciplines through a joint performance involving calligraphy, painting, poetry and music. South Plaza. Produced in cooperation with Tempest Entertainment. Airs; Profiles; Troilus & Cressida (Reduced); Piazzolla Caldera. The Trisha Brown Company is funded in part by the National Endowment for the Arts American Masterpiece: Dance initiative, administered by the New England Foundation for the Arts. Thursday, August 16 and Friday, August 17 Los Angeles-based Lula Washington Dance Theatre blends Afro-Caribbean, modern, street-dance and jazz techniques to create powerful depictions of the African-American experience, both past and present. Presented in cooperation with the Chinese American Arts Council. Produced in cooperation with Solar One’s Dance Festival. Produced in cooperation with Community Works NYC. The juggling guru will delight and amaze kids of all ages with his outlandish juggling. dance, song, ritual and the earthy humor of West African folk culture of Senegambia. Patrick Makuakane, company director and choreographer, provides musical accompaniment in the form of chanting for performances by this San Francisco-based troupe. Hawaiian musicians join the company. In addition to the traditional hula, the artist’s perform Makuakane’s own fusion style, hula mua, (“hula for the future”) which blends traditional movements with non-Hawaiian music like hip-hop. Modern dance fused with African and African-American traditions is performed by this acclaimed company founded in Los Angeles 28 years ago. Kids will learn street dances and drills. 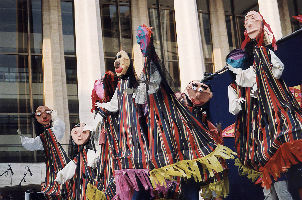 One of New York’s most anticipated summer traditions, Lincoln Center Out of Doors is enjoyed annually by thousands of people who come to its FREE music, dance, spoken-word, special events, and interactive family programs representing traditional and contemporary arts and culture from around the world. Conceived in 1970, and launched in 1971 as a small festival of street theater “to bring the community to Lincoln Center and bring Lincoln Center to the community,” Out of Doors has grown into one of the largest free summer festivals in the U.S., with audiences averaging 200,000 each summer. Over the past 36 summers, Out of Doors has commissioned nearly 80 works from composers and choreographers; presented hundreds of major dance companies, renowned jazz musicians, and traditional music and dance representing the rich cultural diversity of New York City; created week-long celebrations of U.S. regionally-based artists as well as daylong programming featuring performers from Mexico and Canada; and presented the perennial favorite “Roots of American Music” celebration. Programs and Artists subject to change. All events are FREE and open to the public. 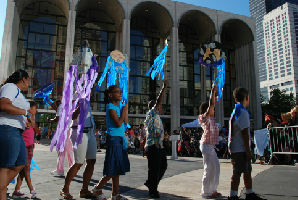 For more information on Lincoln Center Out of Doors, call the events hotline at 212-875-5766 or visit the Lincoln Center website at www.LincolnCenter.org.